Started by wxgrant - Feb. 10, 2019, 4:23 p.m.
Hope everyone is having a great weekend. I am wondering what commodity based ETFs are available. I have searched and found many available. Was wondering if anyone traded in these ETFs. Just trying to compose a list of funds to choose from. Are you sure you want to delete this post: ETFs? By metmike - Feb. 10, 2019, 6:49 p.m. Wonderful topic to bring up. Some commodity exchange traded funds are bad news if you are long, long term. Because of contango that ordinarily exists, the price of the futures contracts is higher, the farther you go out from the front month. There are specific fundamental reasons for this that are independent of market expectations for higher prices(storage/risk premium etc). So what happens is that these ETFs that are long the futures must roll..... sell the front month and buy the month(s) farther out at a higher price. Even if the natural gas cash price stayed the same all year, these rolls in a contango market will feature new buying at higher prices at every roll point, then prices going back down the where you sold the front month previously, where the ETF sells it(at the lower price) when that contract is getting ready to expire. This happens over and over with the fund taking a contango based loss each time independent of where the market price goes. There are some ETFs that buy much farther out contracts to minimize the roll dynamic(not as many rolls) but the ones that roll the most and with the shortest expiration months..........in a typical contango market are like playing poker with 1 card less than everybody else each round. Energy ETF's continually look cheap because they keep going lower. At least the ones with the shorter contract expirations that I was familiar with several years ago. Are you sure you want to delete this post: Re: ETFs? By cutworm - Feb. 10, 2019, 6:50 p.m.
By metmike - Feb. 10, 2019, 6:54 p.m. The (NYSE:USO) Fund tracked the performance of crude oil well through 2008, but contango affected the price in terms of monthly roll-over, which eroded the value of (NYSE:USO) over time. 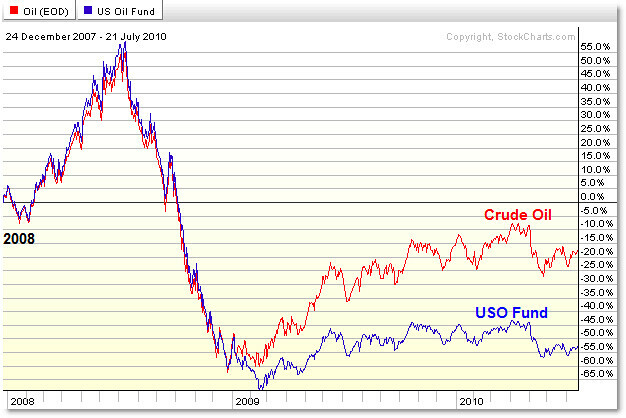 From 2008 to present, crude oil is down 20% while the (NYSE:USO) Fund is down 55%. Unfortunately, the disconnect began right when many investors bought this fund – there is a huge volume spike during early 2009 (not shown). 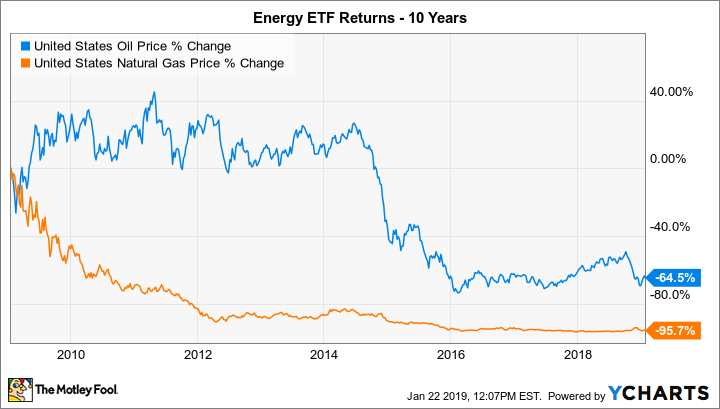 Like (NYSE:USO), the (NYSE:UNG) Natural Gas ETF tracked the performance of underlying Natural Gas futures well… until early 2009, but the big dislocation was September 2009, and from that single month, the (NYSE:UNG) has grossly underperformed the futures. 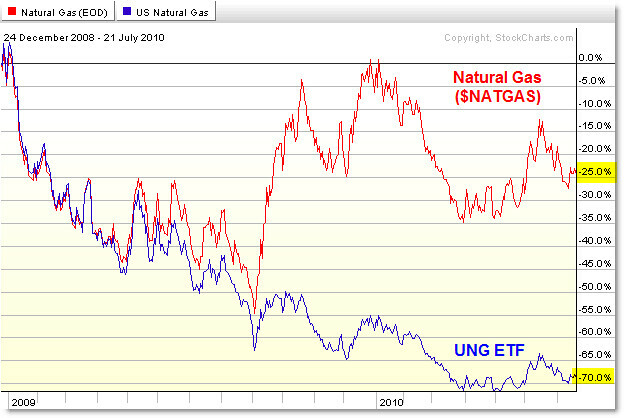 From 2009 to present, Natural Gas futures are down about 25% while the (NYSE:UNG) ETF is down 70%. It’s not that the funds are evil or bad, it’s just that they suffer from the effects of contango when ETF fund managers roll-over the holdings to the next futures month, which is priced higher than the current month – hence contango. Are you sure you want to delete this post: Re: Re: ETFs? By metmike - Feb. 10, 2019, 6:59 p.m.
GASZ allows you to bet on a persistent contango environment in the natural gas futures market. The ETN is linked to the performance of the ISE Natural Gas Futures Spread™ Index (GYY) which shorts the near month natural gas futures contracts and goes long the midterm Henry Hub natural gas futures contracts. For as long as contango exists, GASZ will be able to profit from its short positions in near term contracts. The biggest risk is for NG prices to fall in backwardation (opposite of contango). But from looking towards 2020, GASZ seems to be the perfect vehicle to hold as NG is virtually stuck in contango. By wxgrant - Feb. 10, 2019, 7:01 p.m. Awesome information. Thanks. Rolling the futures makes since on why an ETF will lose evening if the commodity stays the same price. I have traded options on SPY, QQQ, UNG, and USO. I assume the same happens with CORN and WEAT and other commodity based ETFs? Are you sure you want to delete this post: Re: Re: Re: ETFs? By metmike - Feb. 10, 2019, 7:10 p.m. Yes on other commodity based ETF's that are in typical contango, which is most markets most of the time. Exceptions would be strong bull markets that are price rationing a near term shortage in supply with prices spiking higher to stifle near term demand(where longer term, the supplies are expected to return and prices fall)...that's called backwardation. Are you sure you want to delete this post: Re: Re: Re: Re: ETFs? By metmike - Feb. 10, 2019, 7:15 p.m.
"Backwardation relates to the price of a futures contract and the contract's time to expire. As the contract approaches expiration, the futures contract trades at a higher price compared to when the contract was further away from expiration. This is because the spot price is above the futures price, and the contract and spot price must eventually converge, so the future's price rises toward the spot price. " metmike: This is not a great/complete explanation above. A front month can trade higher than the spot/cash price if it expects a shortage BEFORE the spot price experiences it. Regardless, backwardation is the exception and usually only occurs when historical fundamentals go out of balance or demand/supply dynamics go extreme and demand greatly exceeds supplies in the short term............enough that prices must spike higher, temporarily to stifle the excessive short term demand because there isn't enough of it at price X. At price X +$1, some of this demand will be stifled. At price X +$2, there will be even less demand. The markets may take several months to adjust because thats how long it takes to increase supplies. The expression, the cure for higher prices, is higher prices applies here. If a market price is spiking higher because demand is exceeding supply, those in the supply business will see additional opportunities for profitability at the higher prices and take advantage of that by increasing supplies for the market. So backwardation usually does not last long with large producers maximizing opportunities to bring increased supplies to the market for a profit. A severe drought in the Midwest would be one wonderful example. The new crop in the ground is getting wrecked by the weather and the market goes into backwardation...front months all spiking to much higher prices than the farther out months........ because it will take many months for the next crop to come on board and restore the supply balance. After the spike higher does its job and curtails enough near term demand, the market will settle down. One thing that it can do is cause buyers to DELAY their purchases, if possible, to when there are more supplies expected with cheaper prices........so there will be a demand shift based on timing. 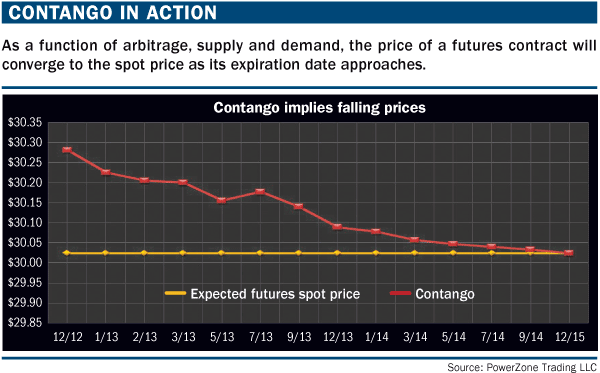 By metmike - Feb. 10, 2019, 8:30 p.m.
Because contango implies that price must fall, long positions in contangoed markets can lose value. “Contango in action” (below) illustrates this concept. By becker - Feb. 10, 2019, 8:41 p.m.
Every ETF has an expense ratio. It does'nt matter if you are long a long etf or long an inverse etf, there is an expense. Turn it upside down: short a long etf or get long a short etf, there is still vig. By metmike - Feb. 10, 2019, 10:17 p.m. Thanks becker, great to read you here! By wxgrant - Feb. 11, 2019, 11:50 a.m.
Decided to sell a call spread in UNG. Sold the March 15th exp 25/28. Collected $36 per contract risking $300. Just felt like trying it out. We shall see. Are you sure you want to delete this post: Re: Re: Re: Re: Re: ETFs? By metmike - Feb. 11, 2019, 12:36 p.m. Appreciate you sharing this with us Grant. Several months ago, I stated that you had the analytical mind of a successful trader. Are you sure you want to delete this post: Re: Re: Re: Re: Re: Re: ETFs? By wxgrant - Feb. 11, 2019, 3:23 p.m. Thanks Mike. I am going to make an effort to share more on the forum. Lots of great information here. Are you sure you want to delete this post: Re: Re: Re: Re: Re: Re: Re: ETFs?